During my childhood, instead of falling in love with Cinderella and Snow White, I used to watch all the time Alice in Wonderland and Mary Poppins (with the addition, as I grew up, of Back in the Future and Rocky Balboa). I knew all the lines by heart, and even now when I watch them, I can repeat most of the script. So once in a while I like to go back in wonderland! 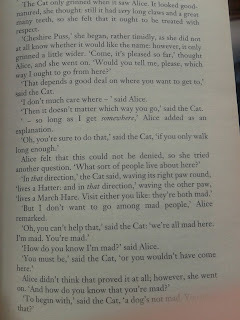 Emotionally I go there very often, when I want to escape this mad world ("but you must be mad too to imagine it"), "physically" I have been recently there: I was in the cup of the Mad Hatter tea party, in the Cheshire Cat's labyrinth and down the rabbit hole, a dream I had since I was a kid. I read the book many times, in many versions, but those riddles and rhymes are able to enchant me every time. 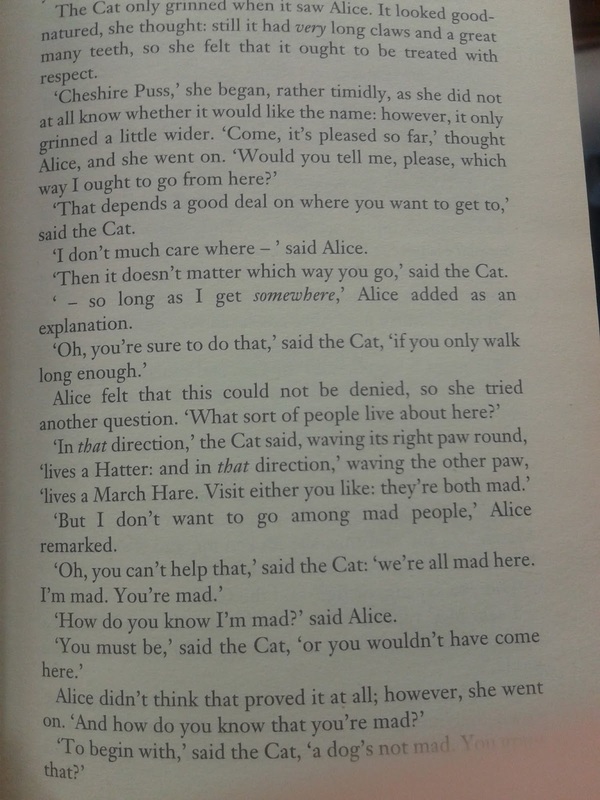 The main questions that follows Alice every where are: who she is and where she ought to go, the most normal and easy questions in "our" world, but there underground nothing seems as it is. There is actually a book, not as famous as Alice in Wonderland, that tries to find out who Alice is, and if she is at all happy of being Alice in Wonderland (Alice I have been by Melanie Benjamin), which I recommend to have a better idea of the life of Alice. Few have actually read the sequel of Alice in Wonderland, Through the Looking Glass, which I find at times nicer than the first book. And without reading it, it is hard to realise that the Disney cartoon and, even more Tim Burton's movie, represent lot of facts happening in the second book. For instance while watching the movie by Burton, you might have asked your self who is this Jabberwocky. Well it is definitely not an invention of Burton, but rather a mysterious riddle you find at the beginning of the second book, with a note of the author that I will not spoil it for you here. I was indeed amazed to discover that the Cheshire Cat sings this poem in the Disney's cartoon (video here). Spoiler Alert (jump if you wish): Since we are talking of Burton's movie, let's get this straight: if he would have called the movie by a different name, something like "Alice BACK in Wonderland" or the sequel, I could have watched it with a different spirit, but please Alice and the Mad Hatter cannot fall in love, even if the Mad Hatter is Johnny Depp!!! Without even talking of how badly the Cheshire Cat is represented. Apparently the sequel of the movie is going to be released next year and I am afraid of watching it.